Barilla’s Field to Fork Model can be identified as a noteworthy use case on the Internet of Products. Founded in 1877, Barilla is an Italian food company which produces a variety of pasta and sauce. Barilla has made a huge impact through its traceability efforts and consumer transparency initiatives. The company uses an internet of things model to help customers track the supply chain. The brand’s Field to Fork project also has a dedicated website explaining the “journey behind these gestures”. Glancing through their website, one can scroll and navigate through the entire process in detail, while browsing pictures, texts, videos and other relevant information. Barilla’s “Digital Passports” serve as the single source of information to track the food products. Let’s take a look at how Barilla uses the Internet of Products to overcome challenges in the consumer transparency industry. Today’s consumers are not only health cautious but are also knowledge seekers when it comes to their food. They want to know exactly where their food comes from. Consumers care about where their food comes from, how sustainable it is, and how it reached them among other things. This helps them in making better purchasing decisions. On the business side, traceability is just as important. Knowing the exact origins of every ingredient or component of a product, being able to track every movement of every component of the product across the supply chain and beyond can have big implications. The challenge of product recalls both for food retail as well as non-food sectors costs companies millions of dollars every year and often involves shutting down the entire supply chain or branch of the supply chain to trace back a defect or source of quality issues. According to the Grocery Manufacturers Association in the U.S., the financial impact of a recall is quite significant: 52% of all recalls cost over $10M and 23% cost over $30M. But what if you could trace back to a very specific source and only cut suspend supply from that one farm or one supplier? The underlying IoP concepts are playing a major role in this process and leading pasta brand Barilla has a great example of food traceability. How Barilla Utilizes the Internet of Products? When it comes to food chain supply, tracking everything that happens downstream is key. What if you could pick up a product and actually look up the journey and path it took right from it’s earliest stages all the way up to you right now? Thanks to the core underlying concepts of the Internet of Products, this can be done by creating digital records of the products and assign values or activities to them at each point. 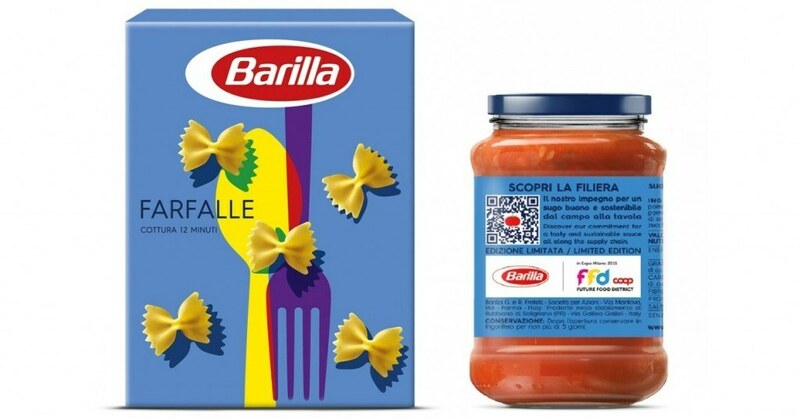 Barilla launched the“Farm to Fork” which uses digital labels activated by QR codes on their products to provide customers with a view into the journey a product took right from the farm to their plate. Customers can scan the package’s QR Code to learn exactly where, when and how each ingredient was procured. They can also scan the package to see the exact farm to plant to store supply logistics. In order to achieve this, Barilla assigned a “Digital Passport” to every product or a traceability log accessible on the internet. As the actual source ingredients like the wheat moved from the farm it was grown on to the storage facility and onwards, the location and activity performed would be stamped or recorded on this Digital Passport so that when users finally scan the QR code on that product, they can trace back the journey and these points that were logged onto that Digital Passport hosted on the internet. As part of Barilla’s Safety for Food initiative, the IoP and the data being logged against each product is helping the company fight against food counterfeiting while elevating food safety practices and Barilla’s brand’s image. The IoP enables maintaining activity logs or transaction logs at a product level or individual instance level for every package or product offline. This allows activities, locations and other events to be logged or recorded against a product much like the stamp in a passport. The same information log can then be also be made available to consumers with a product trigger like a QR code in Barilla’s case in order to empower them with knowledge about how and where exactly their food product comes from.These very same concepts can enable numerous traceability applications whether it’s tracking the location of items, delivery schedules, ingredient sources, ownership history, usage history and more. The Internet of Products will have a large impact on traceability and the data it generates in the process will have some further benefits in the form of business insights.